Now that submissions have closed and final selections have been made, we are thrilled to share the final selections for the ebook/print version of ROBOT DINOSAURS! 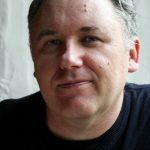 Aidan Doyle is an Australian writer and computer programmer. His short stories have been published in places such as Lightspeed, Strange Horizons, and Fireside. He has been shortlisted for the Aurealis, Ditmar, and XYZZY awards. 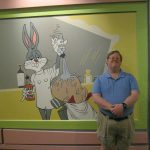 He has visited more than 100 countries and his experiences include teaching English in Japan, interviewing ninjas in Bolivia, and going ten-pin bowling in North Korea. D.A. Xiaolin Spires bridles and saddles her electronic dino before rushing to the grocery store. 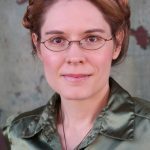 Besides ROBOT DINOSAURS, her work appears or is forthcoming in various publications such as Clarkesworld, Analog, Terraform, Nature: Futures, Fireside, Grievous Angel, Reckoning, Galaxy’s Edge, LONTAR, Andromeda Spaceways (selected for the Year’s Best issue), Mithila Review, Issues in Earth Science, Factor Four, StarShipSofa, Liquid Imagination, Star*Line, Liminality, Eye to the Telescope, Atlas Poetica, Outlook Springs, Gathering Storm Magazine, Little Blue Marble, Polu Texni and Story Seed Vault. Her fiction also appears in other anthologies of the strange and delightful, such as Deep Signal, Future Visions, Sharp & Sugar Tooth, Broad Knowledge, Battling in All Her Finery and Ride the Star Wind. You can find her on her website: daxiaolinspires.wordpress.com or on Twitter: @spireswriter. 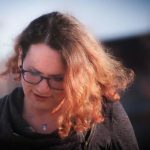 Izzy Wasserstein is a writer of poetry and fiction. 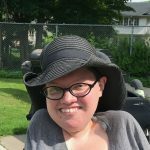 Her work has recently appeared or is forthcoming from Clarkesworld, Apex, and Fireside Magazine, among others. Her most recent poetry collection is When Creation Falls (Meadowlark Books, 2018). She shares a home with the writer Nora E. Derrington and a variety of fury companions. Reports that she is, in fact, a cyborg fox remain unconfirmed. 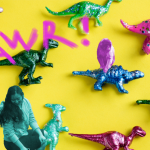 Jennifer Lee Rossman is an incurable dinosaur nerd. Jurassic Park has been her favorite movie since she was four, and she was that annoying child who complained to waiters about the scientific inaccuracies on the dinosaur placemats. Her debut novel, Jack Jetstark’s Intergalactic Freakshow, will be published by World Weaver Press in December. Alas, there are no dinosaurs in it. Michael M. Jones lives in southwest Virginia with too many books, just enough cats, and a wife who prefers her mad science to be of the social varieties. His stories have appeared in numerous anthologies and magazines, such as Clockwork Phoenix 3, Utter Fabrication, and E is for Evil. Daphne and Camille first appeared in “Saturday Night Science,” in the first issue of Broadswords & Blasters. Michael also edited the anthologies Scheherazade’s Facade, and Schoolbooks & Sorcery. For more, visit him at www.michaelmjones.com. The rest of the online-scheduled fiction will be published as planned! We’ve commissioned artwork for all the new hatchling stories, and the plan is to send the ebook/print book of ROBOT DINOSAURS! to the printers by October 1st, 2018. This means you should be getting your claws on the finished product by December—just in time for gift-giving and curling up in a warm nest to read on the snowy days to come! Open Submissions Period Announced for ROBOT DINOSAURS! Well, have we got awesomsaurus news for you! August 1st thru 15th, 2018, we will be open to general fiction submissions! Want a sneak peak at the guidelines? Read on! RESPONSE TIMES: We will have all final responses sent out by the end of August 2018. Initial responses (rejection or hold notices) will be sent on a rolling basis, dependent on how fast we can read subs (and the volume of material we get). When the open submissions window opens, the email address for subs will be posted on the guidelines page! Posted in newsTagged news, robot dinosaurs!, submissionsLeave a Comment on Open Submissions Period Announced for ROBOT DINOSAURS! Greetings, mighty dino friends! We’re delighted to present artist Toe Keen‘s stunning banner-style art for the July and August issues of ROBOT DINOSAURS! It is inspired by our first story in July, “Even to the Teeth” by Karen Osborne. You can check out more of the artist’s work at his website: www.atoekeneffort.weebly.com or on Facebook! What is good in life? ROBOT DINOSAURS! Behold, the official launch of the Kickstarter! So what is this project? 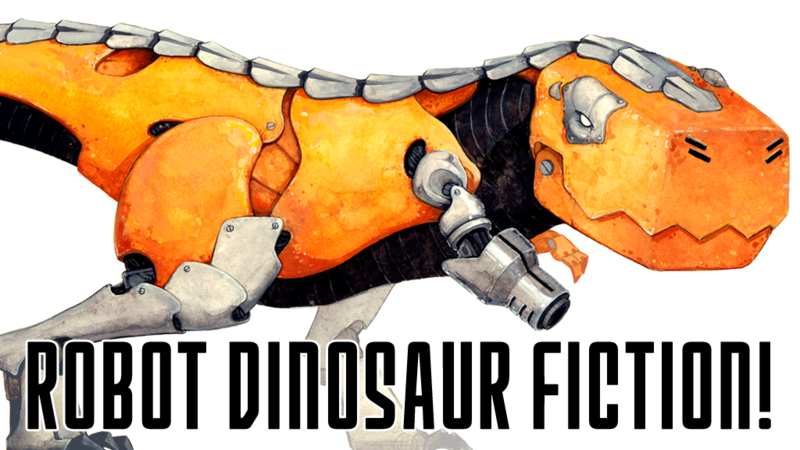 Robot Dinosaur Fiction! is a virtual anthology: each Friday from May through August, 2018, a new flash fiction story will be published right here, free to read. When the summer wraps up, all the stories will be collected in an anthology, with an exclusive bonus story by Vina Jie-Min Prasad! So far we have an all-star lineup of authors and artists! LOOK AT THEM ALL. How cool is this?! There are all sorts of cool rewards for backers: e-book and print book copies of the anthology, postcards with awesome ROBOT DINOSAURS! artwork, exclusive bundles of books, hand-made plushies, and more. SUPPORT SCIENCE! Roar with us! Fund your local robot dinosaur initiative. Thank you for believing in ROBOT DINOSAURS! Posted in newsLeave a Comment on The Kickstarter Is Alive!